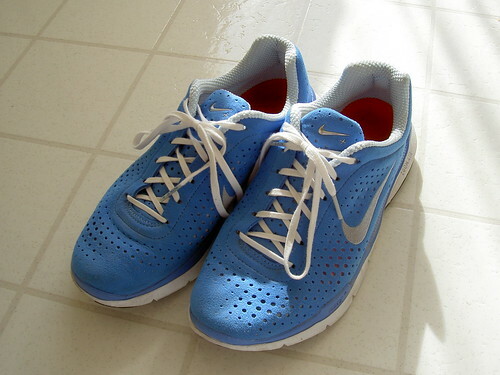 My husband bought me a pair of Nike running shoes↑ and a running chip which is produced by a collaboration of iPod and Nike. 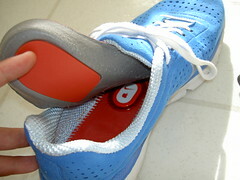 This chip is inserted into the shoe. 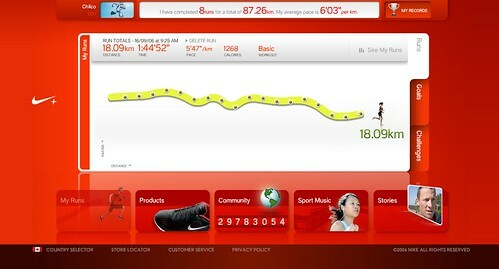 This chip connects to iPod nano wirelessly and calculates distance, speed, pace, calories and so on. During your jogging, you can monitor these information. 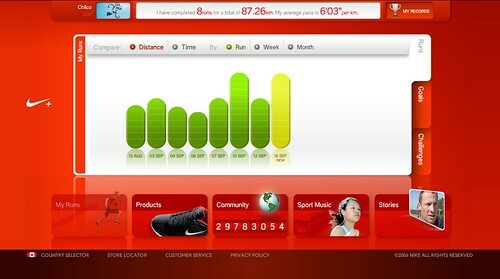 After running, you connect your iPod into your computer and downloads data to Nike site. It records your running data. 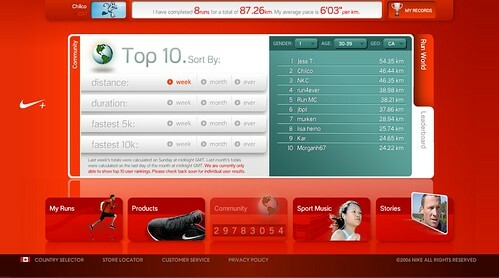 You can also compare with other runners who have the same device in UK, US and Canada. I came to the second in this week’s distance, but my husband said that there are not many people who have this machine in Canada. In this ranking you see your ranking but not the number of total people. Currently the site doesn’t show your rank, maintenanced or something. Boo! Apprently 450,000 of this chip was sold in the States. One chip costs 30 bucks. The thing I love most of this toy is that when I make the best record, Lance Armstrong’s voice comes at the end of my workout and says, “This is Lance Armstrong. You have done an awesome workout.” I was so touched when I first heard it. This machine has been useful for my training of the Victoria Half Marathon in October. ☆Mrs. K. Thanks, I like the blue.